ComBio 2017 was the first conference I attended during my PhD studies and it was so unforgettable, as I saw the outline of the future of agriculture in this conference. 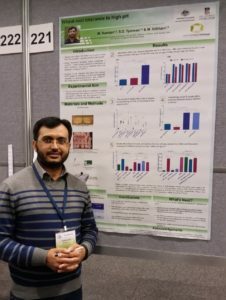 I presented my poster about QTL identified on controlling photosynthetic traits in Barley, talked about the genetic research done on physiological traits. I was so happy and grateful for the valuable chance of attending Combio2017, because I learned so much there and other great scholars work has inspired me so much for my own research. ComBio2017 was held at the new and state of the art Adelaide Convention Centre located in the heart of the city on the Torrens River, we could see the magnificent Adelaide Oval Precinct. There were eight themes including Plant Biology, Biotechnology and Sustainable Futures, Developmental, Stem Cell and Regenerative Biology, Proteins and Proteomics, Genomes, Epigenetics and Bioinformatics, Cell Biology, Cell Signalling and Metabolism and Education and Career Development. Every theme presented great talks. Professor Jian-Kang Zhu’s talk on “Decoding the epigenetic language of life” has changed my understanding on drought, cold and heat, and salt stress signalling pathways and resistance mechanism. Now I understood epigenetic mechanisms of gene regulation and their roles in abiotic stress resistance. Another talk was given by Professor Tim Colmer on Photosynthesis and internal aeration of submerged rice. Thanks to ASPS funding for ComBio2017. The opportunity to attend ComBio2017 is so precious. By 2050 we are expected to have 9 billion people to inhabit the planet, consuming 70–100% more food than is currently available. Such enormous challenge is possible to concur with the collaboration of all agricultural scientists. 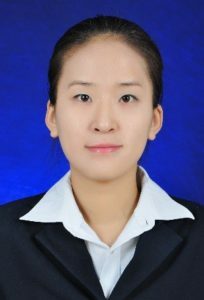 Si Li, PhD Student, The University of Sydney, Sydney Institute of Agriculture | School of Life and Environmental Sciences. 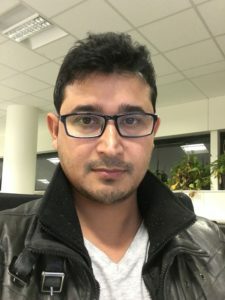 I am Muhammad Kamran, a PhD candidate with Professor Stephen Tyerman’s Group at the University of Adelaide, South Australia. Recently, I submitted my thesis for examination. My PhD project has focused on understanding the tolerance of wheat to high pH stress, a condition that affects about a third of Australia’s and the world’s agricultural soils. I had the opportunity to present some of my PhD work at COMBIO 2017 Adelaide. My research was recognised with an Australian Society of Plant Scientists (ASPS) student poster award. Being an ECR, I was very delighted with my research recognition through this award as it provided me with a significant boost and encouragement to continue my career as a plant scientist. COMBIO 2017 provided me with a great opportunity to present and receive quality feedback on my work. I displayed my poster for three days which provided great exposure of my work. I also benefited from face to face interactions with other fellow researchers which resulted in establishing networks, finding future directions and subsequent collaborations. Plenary lectures were really awesome and informative. It’s very important to get up to date in my research area. Attending COMBIO 2017 provided the opportunity to be updated, get wide research exposure, exchange of ideas and learn about new things. Being an elected student representative of ASPS, I helped to organise the formal society dinner. It was an awesome experience which helped me to build new contacts. I am incredibly grateful to the ASPS for awarding me the ASPS student poster prize and feel privileged to be an ASPS member. Muhammad Kamran, PhD candidate at University of Adelaide, Australia. Combio-2017, the best conference so far I have attended in my academic career. I attended the combio-2017 just two and half months after starting my PhD. I presented a poster highlighting initial findings in my first experiment on developmental expression profiling of ammonium transporters in soybean nodules. I was very excited with my work and to be honest a bit worried as well about my poster with a feeling that I may get tough questions from top academics. However it was unbelievably encouraging when a field related renowned academic like Prof. Steve Tyerman came to see my poster and said “probably this is the gene we have been looking for a long time.” I just couldn’t believe that, wow! Combio-2017 was a massive conference with eight themes and incorporated three society’s annual meetings. It’s really great to see scientists and academics from different backgrounds under one roof. There was coherence within the themes and I realised we really need scientists from different backgrounds at the same time to step forward in science. I was very lucky to get a travel grant by ASPS without which I couldn’t make it. There were too many sessions I wanted to join and unfortunately not all were possible. Some worth mentioning were calcium transporter by Wang, Aquaporin gene expression by Scharwies, sugar transporter by Rautangarten, Arabidopsis ion transporter CCC by Wege. Lectures related to my PhD research plan like fluorescent microscopy by Gormal, nutrient exchange in mycorrhizal symbioses by Plett, and grain nitrogen filling by Julie were impressive. ASPS goldacre award lecture by Asso. Prof. Plett headlining “Tuning into rhizosphere radio” and plenary lecture by gene editing genius Prof. Zhu were just mind blowing. I was interested in gene editing and gained a lot of information from the lectures by Zhu, CRISPR-Cas delivery by Rouet, gene editing in cereals by Luo, and genome editing in nicotiana by Naim. There was a lot of information presented in poster sessions while poster teasers were marvellous. To me, Combio-2017 was not just a conference, its way more than that. I met many scientific companies whose chemicals I use often. I was very fortunate to see people with whom I had several email conversations. I met employers who were interested in my work, cost free generous offer for plasmid sequencing from a sequencing company was more than my imagination. Combio-2017 was a big scientific community gathering for the students of plant science. No doubt, as a community it’s having a big impact in spreading our innovation and creating opportunities for future scientists. I am really looking forward to attending Combio-2018 with more results and meet all those people whose work I am continuously following. I am really grateful to ASPS for awarding me the travel grant. Thank you very much.